Here's a recipe to start your month off right! Hull and quarter the strawberries (or even eighth them if they are really big). Add berries and white sugar to sauce pan and cook on low for about ten minutes, stirring occasionally. Remove from heat and strain the strawberry and sugar mixture through a fine sieve. If the liquid is runny, put it back on the stove for a bit until it thickens to a syrup. (I didn't have to do this the second time I made it, as it had thickened nicely.) Set aside syrup to cool. Place cooked strawberries in a small bowl and set aside to cool as well. Once cooled, add vodka to the cooked strawberries. The vodka will help the strawberries from becoming icy when they are frozen. Whisk egg yolks, brown sugar, vanilla, and salt in a bowl until smooth. Pour cream into saucepan and heat to just before it begins to simmer. Slowly add the hot cream into the egg mixture while beating them together. Pour mixture back into saucepan and cook on low heat, stirring constantly, until the mixture thickens and coats the back of the spoon. Strain mixture through a strainer into a clean bowl. Allow it to cool slightly and add the strawberry syrup. 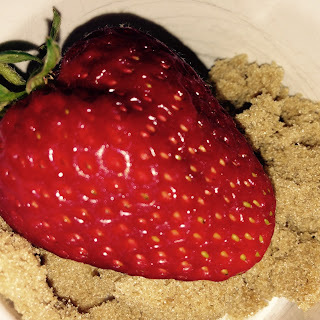 Refrigerate strawberries and ice cream base overnight (or until completely cooled). Add the strawberries to the ice cream maker and churn for a few minutes longer until well mixed. When I am gnoshing on a pint of Ben & Jerry's ice-cream I savor the rich flavors, but as a socially conscious person, I also think about what a good company Ben &Jerry's is. 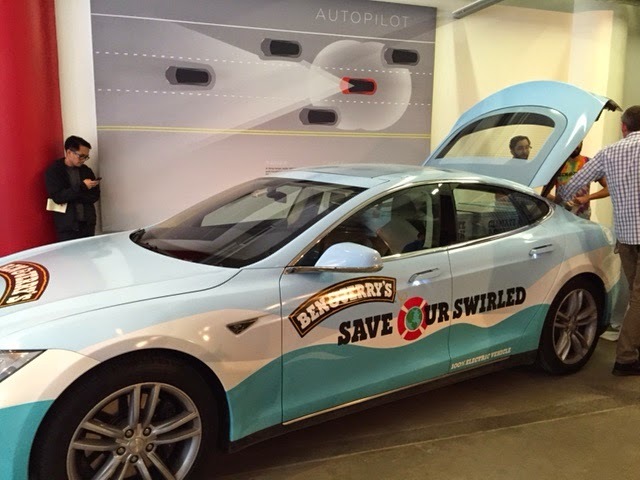 This past Tuesday, March 17th, I was once again reminded why I love Ben & Jerry's when I attended the unveiling of the Save Our Swirled Campaign at the Tesla Motors Dealership in Chelsea New York. 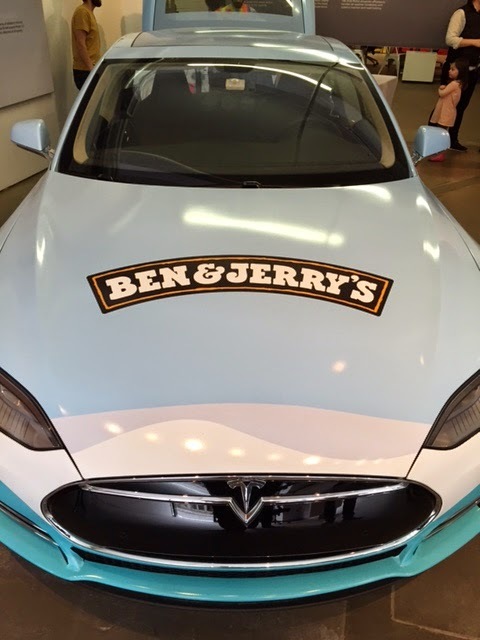 The Ben & Jerry's team is driving across the country in a tricked out zero emissions Tesla S to Swirl up a call to action to help slow down the effects of climate change while serving the masses some ice-cream. 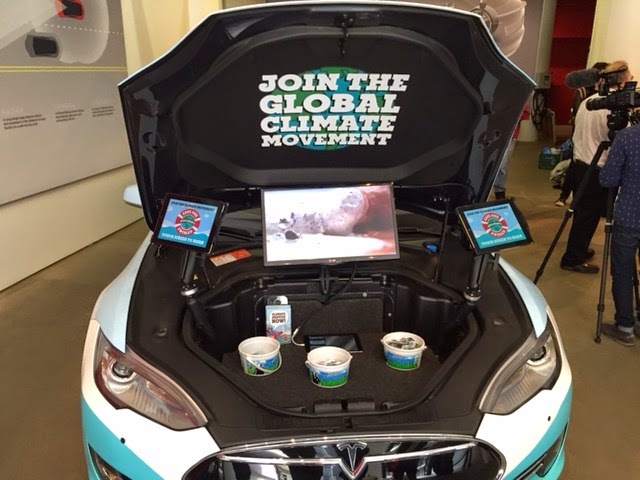 Working with Avaaz, the online activist network, and Tesla Motors, Ben and Jerry's is hoping to sign up over 500,000 new members to the Avaaz petition for Climate Change while they drive across the country. The Tesla Model S that is driving across the country has been specially designed for this trip. Under the Hood of the car you will find a screen giving information about climate change and two i-pads that allow for people to quickly sign the petition on Avaaz. As a global action organizer, Avaaz will help empower people all over the world so collectively we can make a difference and save our planet. 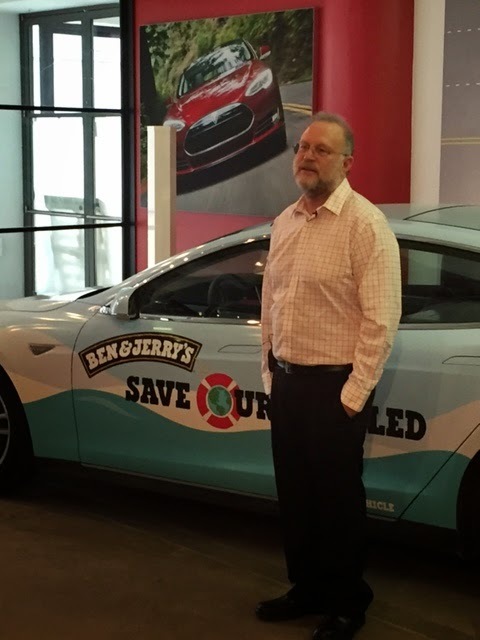 I had the opportunity to sit down with Jerry Greenfield (THE ONE AND ONLY JERRY OF BEN & JERRY's) to talk one on one about Ben & Jerry's and Climate Change. I was immediately greeted with a giant hug from Jerry. Jerry told me that him and his wife have been working towards reducing their carbon footprint by decreasing the amount of plastic containers and waste while driving a diesel car. Ben & Jerry's has been assessing and reducing their environmental impacts for a very long time and are creating innovative ways to reduce their waste and emissions. 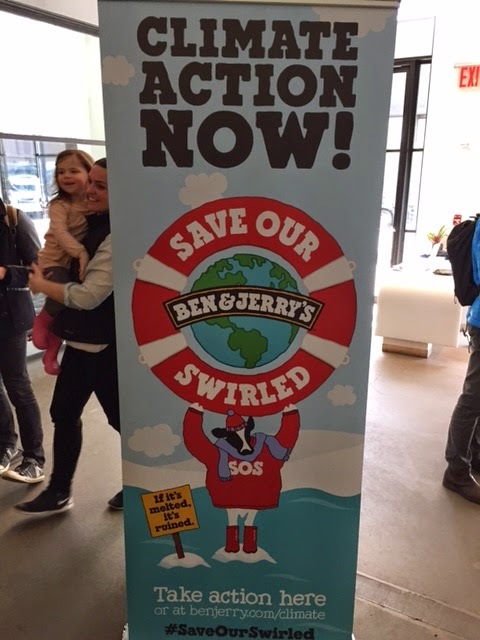 Ben & Jerry's has made a commitment to reducing it's current emissions by 15% per unit of production by 2015 and an 80% reduction in overall emissions by 2050. Jerry conveyed the urgency for everyone to take action to get politically involved regarding the issue of climate change and for people to create change in their everyday lives to decrease their carbon footprint. I've met Jerry once before but this week I really had the opportunity to see his love and compassion for the people who work for Ben & Jerry's and for humanity in general. 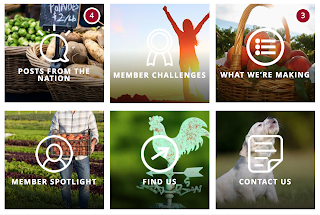 I hope everyone is inspired to take action. 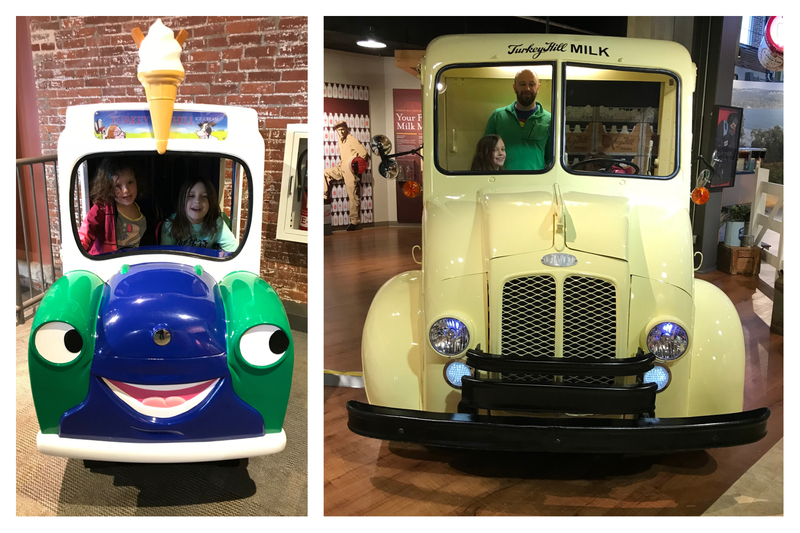 Not just to meet up with the Ben & Jerry's team as they make the trek across the country, but to really invest themselves in seeing that we as a global community urge our governments to protect the future of this great world we live in. Follow this Save Our Swirled Link to find out more about what you can do and sign the petition through Avaaz. 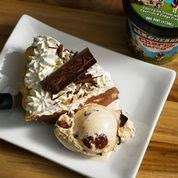 Ben & Jerry's recently sent Scoopalicious their three new flavors; Peanut-Buttah, Boom Chololatta and Spectacular Speculoos. These new flavors were a complete surprise to me but I don't know why I hadn't considered that Cookie Cores might be the next best thing in ice cream! The Flavor Gurus who create Ben & Jerry's flavors are always coming up with new ideas but I think the Cookie Cores are an ingenious and delicious new creation! Peter Lind is the Flavor Guru resonsible for bringing the world these new Cookie Core flavors. I had the opporttunity to meet Peter when Ben & Jerry's invited me up to Vermont last year and to me, he's pretty much a rock star. 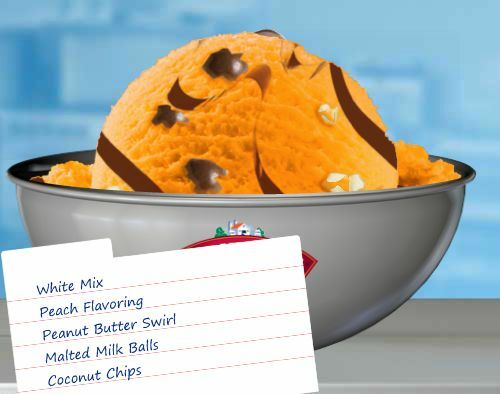 How many people get to create one of a kind ice cream flavors and then share them with the world?! On to the Cookie Core flavors before I share a special interview! Boom Chocolatta! Cookie Core: Mocha & Caramel Ice Creams with Chocolate Cookies, Fudge Flakes & a ChocolateCookie Core. I really liked all of the flavors but I have to say that there was something about the Spectalular Speculoos that I particularly loved. I didn't even know what Speculous cookies were! The belgian butter cookies give an original, crunchy and delicious flavor to the spectacular cookie core. The caramel, vanilla, cookies and the cookie butter core are a delicious meld of flavors. Everyone that I shared these flavors with were gushing about the Peanut Buttah Cookie Core and the Boom Choccolatta Cookie Core. The cores are easy to dig in to and remind you of being able to eat cookie dough off a spoon before you bake them! 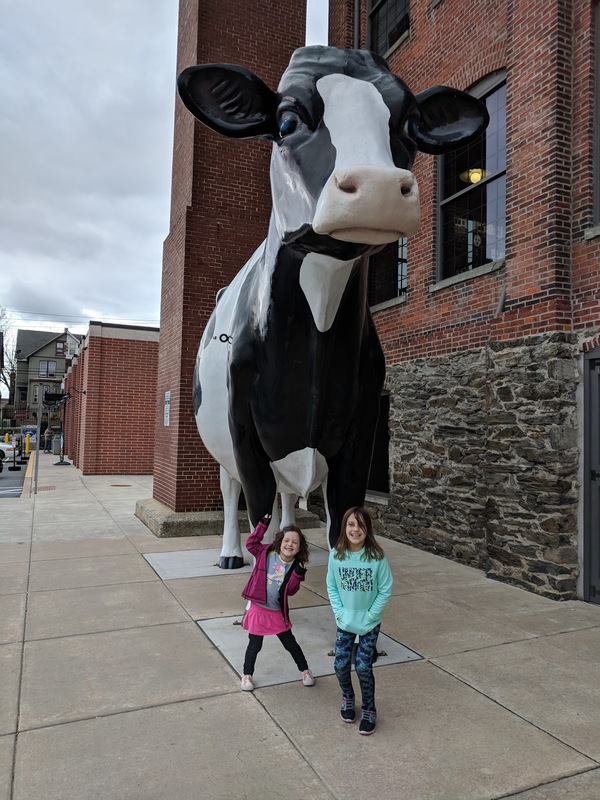 They just happen to be surrounded by a meld of rich and creamy ice cream! I shared the cookie core flavors with my freind's Tracy and Scott's five year old son Nathan and he asked that I interview him to get his opinion on ice cream and the cookie cores! Enjoy this insightful video while trying one of the three new Cookie core flavors!!! 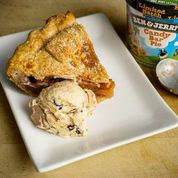 Pie and ice cream go hand in hand for me. If I have a slice of apple pie I definitely want a scoop of vanilla ice cream on top. I can be a traditionalist when it comes to eating over the holidays but I am all for trying new flavor combinations if given the chance. Well Ben & Jerry's own flavor Guru (coolost job ever! ), Eric Fredette and their Assistant Manager of PR Shenanigans (that's her actual title), Kelly Mohr, saved us some creative energy and brain cells by giving us some ingenous ice-cream and pie pairings to indulge in over the holidays! Check out some of the creations they came up with! Coffee Coffee Buzz Buzz Buzz :Think Pumpkin Spiced Latte, need I say more? 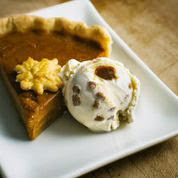 Salted Caramel: Pairs great with warm brown spices and the salt gives a kick to the savory side of pumpkin. Cinnamon Buns : Uses the flavors the pie already has to add a cool creamy element to dessert Candy Bar Pie: Adds a little nostalgia to the holidays. The peanut butter reflects after school snacks with apple slices and peanut butter. Also more and more flavored peanut butter spreads are showing up on the supermarket shelves. 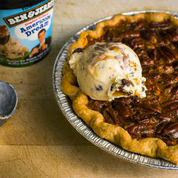 Americone Dream: Adds a creamy and crunchy component to pie. Cinnamon Buns: Cinnamon pairs well with the dried fruit and molasses flavors. Salted Caramel: Salt is a really good complement to the stewed dried fruits that make up mince filling. Chocolate Peppermint Crunch: Chocolate and peppermint have been together forever, and they are still in love. 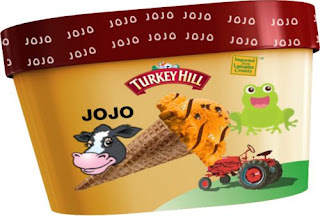 The ice cream has fudge covered crunchy chocolate cookies that add a crunch the crust can’t match. Smooth, creamy, crunchy goodness. 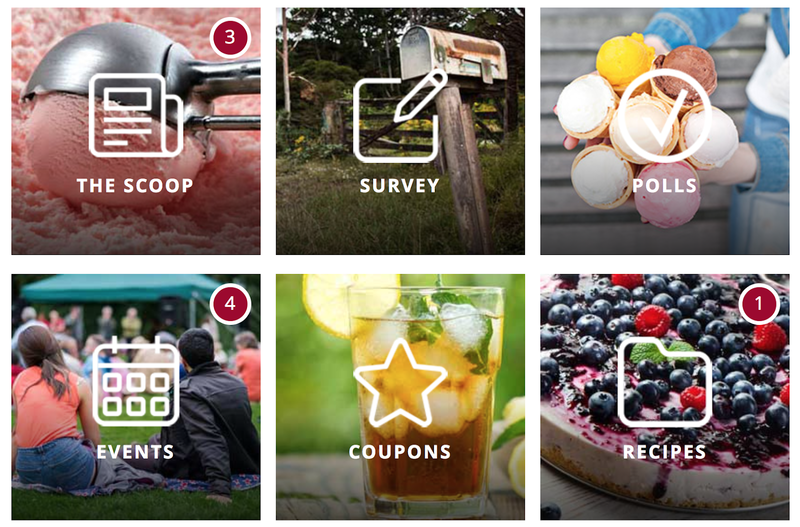 Cherry Garcia :Chocolate and cherries are great together. This pairing is like a box of chocolate covered cherries…only creamier….. with whipped cream. Strawberry Cheese Cake :Sweet and tart in one bite. The lemon acidity of the pie brings out the fresh fruit flavor of the berries. 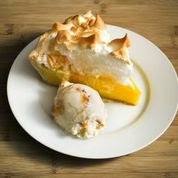 Add the chewiness of meringue and the creamy ice cream and you have a great texture combo. Honey Greek : the tangy greek yogurt plays well with the tang from the lemon filling while adding a creamy dairy note. Like crèma di limoncello, Italy rarely gets anything food related wrong. I cannot wait to try a few of these over the next five days! I think I'll be gunning for Chocolate Cream Pie with Chocolate Peppermint Crunch, Apple Pie with Cinnamon Buns and Pumplin Pie with salted caramel. 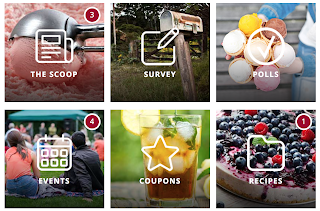 Let us know what combinations you try!